We are all slowly catching Edda's cold, though Edda's fine and going to school. Jeremy's ill now, he went to work this morning, but headed back to the house at lunch to alternate between napping and working. I think I'm next, I've got a running nose/congestion and Vince mentioned today that he thinks he's getting sick too. 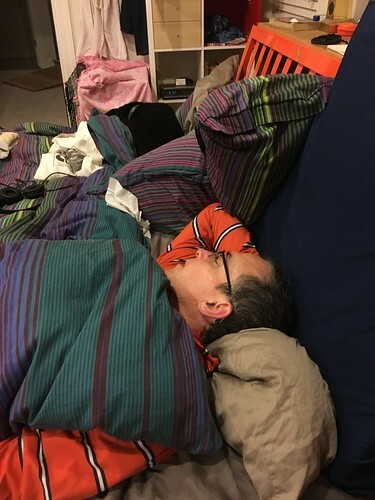 Here's Jeremy - asleep at 8:30 pm. 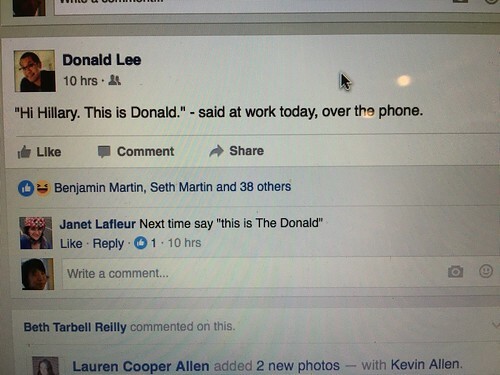 No more politics on this blog - but I will post this from Donald's Facebook feed. Funny. 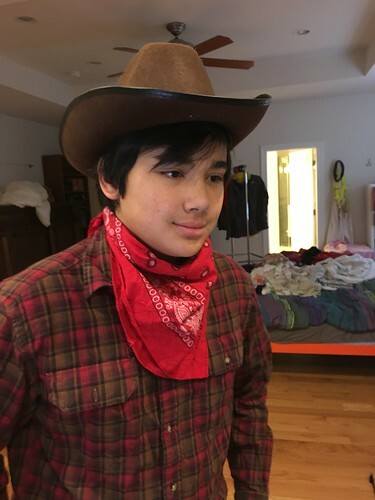 Vince (pictured below during spirit week dressing up for movie theme day - which for freshmen was "Western") took the PSATs today (really, it's the PPPSATs). The real PSATs (still the fake SATs) are in 11th grade - the one to prep you for the real SATs in 12th grade and if you rank high enough on the 11th grade PSATs, you get the National Merit Finalist stuff. But to prep for the PSATs, they start in 9th grade with the PPPSATs and then in 10th grade with the PPSATs (does this make any sense? I'm sorry, I'm not feeling well.). The whole school took the morning to take these exams and then in the afternoon, they got to pick activities to do - Magic club, Engineering class, singing class, etc. Vince was nervous (I think) even though he said he wasn't nervous. He wanted to make sure that I knew that if he did badly, that it didn't mean anything - which is what I think the counselors tell the whole school. Anyways, I assured him that he could do most of the math stuff (they may have some trig stuff he hasn't gotten to yet). Turns out, he thought he got most of the stuff he got to correct, he just ran out of time to do all the questions. Of course, in prep for this exam day, he got no homework yesterday and no homework tonight. lol.